It's no secret that a kitchen should be a bright, uplifting room. Many people think of yellows, natural light and warmth when they consider kitchens, but the trends are leaning toward a cleaner look. We're seeing more and more white paint requests for kitchens, specifically where cabinets are concerned. On the one hand, this brightens the room and reflects natural light back to the viewer. On the other, you're giving yourself longevity and a multitude of decor options by staying neutral. Like the look above, you can mix and match when you stick with whites and other neutrals. The bulk of the kitchen can have a white, clean look while you accent islands, chairs, rugs and even dishes with bold colors. Into a streamlined look? Blend your country home into your kitchen with bright whites, complemented with wood and stone features. Big into accents? 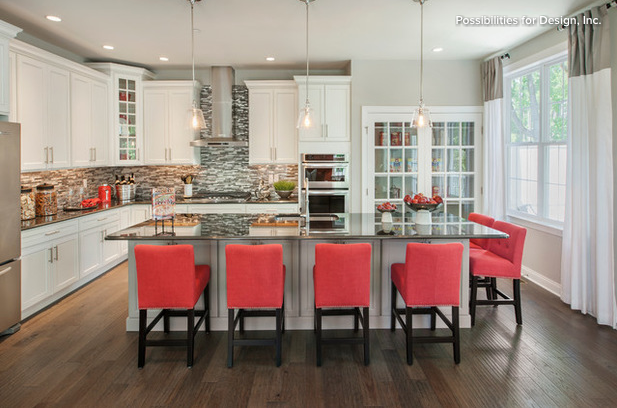 Stay sleek and modern with gorgeous back splashes and functional islands, but add a pop of color on countertops and seats for an appealing visual mix. Don't think that brights can't be mixed with darks when you're talking about kitchens...black and white is a perfect combo for a beautiful look, while dark browns and warm hues can provide the perfect balance against white counters and cabinets. No matter how you do it, adding whites to your kitchen can freshen up the look and give you room to change as your style evolves. Share your kitchen inspiration with us on Facebook! Call Blue Door Painting today to get a look you love.